Rite-in-the-Rain has made a killing on the Marine Corps. Those notebooks can be found in every Marine’s pocket from PFC to Sergeant Major, and each one is filled with hundreds of doodles of demented thoughts and musings of bored Marines forced to take notes during some random class in the field. In every Marine’s notebook, you’ll find the first page to be the only one that contains any important information. This ranges from squad leader names and numbers to rifle serial numbers, etc. Every page after that is usually blank, or filled with half notes of SOP’s, radio procedures, scribbles and random dicks of all shapes and sizes. Occasionally you’ll come across a page with genuine notes from an important class, but the Marine will have long forgotten what the context was, rendering the note absolutely useless. 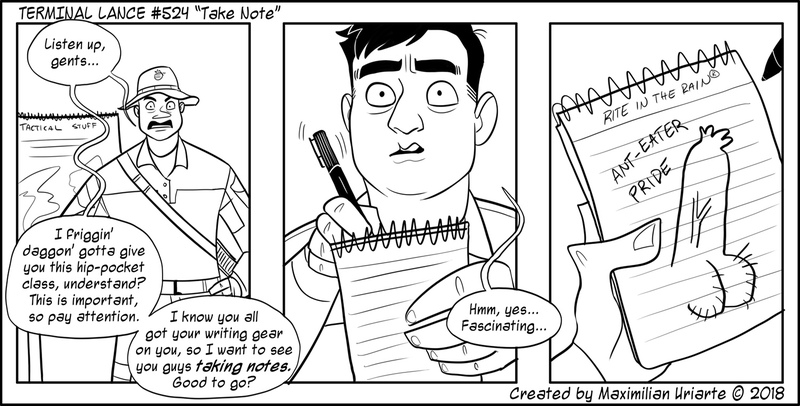 And yet, every single Marine will have their writing gear with them at all times.